Dogs Sleeping Forum • View topic - Does Washington Rule the World? Re: Does Washington Rule the World? They are able to sanction and control other countries due to world trade in US Dollars and their control of SWIFT. That's why Russia has created an alternative to SWIFT and now the EU have come up with their version of SWIFT. Their behaviour, especially under Trump, will lead to their downfall. The world is no longer prepared to be dictated to by the US and mechanisms to act independently of their reach have and are being developed as well as the Dollar being dropped in world trade. Rolluplostinspace wrote: One of the most disturbing aspects of the past two years of Donald Trump foreign policy has been the assumption that decisions made by the United States are binding on the rest of the world. Apart from time of war, no other nation has ever sought to prevent other nations from trading with each other. And the United States has also uniquely sought to penalize other countries for alleged crimes that did not occur in the US and that did not involve American citizens, while also insisting that all nations must comply with whatever penalties are meted out by Washington. Who controls SWIFT Guest and which currency is stipulated for trade in oil? A French language AFP report over the weekend featured surprising photographs of Haitians burning American flags as the unrest and chaos continues especially in the Haitian capital of Port-au-Prince. Major cities throughout Haiti have for days essentially been on “lockdown” due to civil unrest and mass protests demanding that President Jovenal Moise step down over charges of corruption and rampant inflation under his watch — yet unlike similar unrest happening hundreds of miles due south of the small Caribbean country in Venezuela, Washington has stood in support of the president, who since 2017 has found himself facing a flood of popular anger surrounding the PetroCaribe scandal. “We mean that we divorce completely Americans: we took too much occupation in the hands of the United States, we can not,” said Bronson, a small group protester who set the flag on fire. “Based on internal emails obtained from Cornell via the Freedom Of Information Act, the nonprofit US Right To Know concluded that “The Cornell Alliance for Science is a PR Campaign for the Agrichemical Industry” which uses Cornell’s name as cover,” Latham writes. Not strictly Washington but US corporates trying to corner the market and lock countries in to GM foods. When I first set out to map all the places in the world where the United States is still fighting terrorism so many years later, I didn’t think it would be that hard to do. This was before the 2017 incident in Niger in which four American soldiers were killed on a counterterror mission and Americans were given an inkling of how far-reaching the war on terrorism might really be. I imagined a map that would highlight Afghanistan, Iraq, Pakistan, and Syria -- the places many Americans automatically think of in association with the war on terror -- as well as perhaps a dozen less-noticed countries like the Philippines and Somalia. 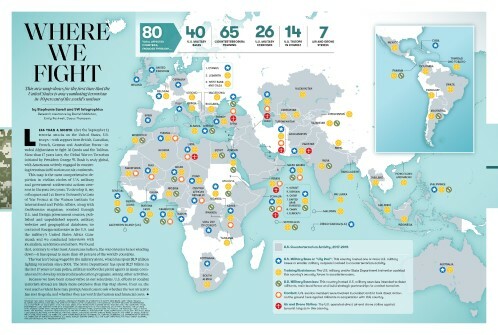 I had no idea that I was embarking on a research odyssey that would, in its second annual update, map U.S. counterterror missions in 80 countries in 2017 and 2018, or 40% of the nations on this planet (a map first featured in Smithsonian magazine). washington is the west coast. art0hur0moh wrote: washington is the west coast. the state of washington is, art. and then there is the district of Columbia. bad land are in Washington?